Background: At Oberlin College, I had learned about radio at the student-run radio station. In graduate school at Syracuse University, I learned about television. Our class of approximately 73 members was the 22nd class to take the one-year masters program, so we were called Sequence 22. When we arrived, someone found a disturbing note from the previous year's class, Sequence 21. It read "Sequence 22, go home. It ain't worth it." We took that note under advisement. As the year unfolded, most of us found that it was worth it. This thread is about my studies; click here for a thread about living in upstate New York. I was quite pleased to find your letter here waiting for me when I arrived Monday afternoon; made me feel right at home to have mail on my desk already. Monday seems like a very long time ago now, though. All day Tuesday, and then Tuesday night, and then all day today, were spent in getting to know my seventy-some classmates in the TV-Radio graduate program, as well as the professors and some of the facilities. One piece of information we picked up today was that we will soon be given a reading list of a hundred books or so, chosen from diverse fields such as philosophy, social science, religion, and political science. We are expected to read 25 of these books by next July, at which time we will be given an essay test on the books we have read. This is the TV department's way of insuring that we get a liberal education. Part of their goal, of course, is to make sure that broadcasters are responsible members of the society they serve, and like that. I find it very difficult to find a pencil sharpener on this campus. My larger classes, those that included all members of Sequence 22, met in an auditorium in this journalism building now known as Newhouse One. Click here for an interior view of the lobby. The Studio Ops and the Production courses are labs, involving the use of Syracuse's so-called TV "facilities" in the basement of Carnegie Library. There's one studio down there, originally built as a radio studio in the 1930's and converted for TV use in 1950. It's no larger than WOBC's studio A (the largest one), except that the ceiling is higher to accommodate the lighting. And that's it. Oh, we do get to use the facilities of the local educational UHF station for part of the Production course. But for most of our purposes, the on-campus studio, unimpressive as it is, will be more or less sufficient, we're told. We're not here to be taught how to be broadcasters; we're here to be taught about the whole field of broadcasting. So says the founder and patron saint of the program, Dr. Bartlett. I misinformed you in my last letter. The Syracuse TV facilities do not consist entirely of that one small studio; the Studio Operations course also deals with film and audio, and there are special facilities for each. For film, we get on a bus which takes us a couple of miles out to the Vincent Apartments, which are the University-owned housing units for grad students. They're a series of three-story structures built somewhat similarly to Barrows, with underground tunnels connecting the basements of all the units. An end of one of these basements has been walled off, the windows painted black, and the inside cleaned up a little, and then they put a sign on the door: "Film Annex." This is the TVR department's film studio. Nearly a week ago now it was that I got my first taste of television directing, in the Studio Operations course. That's what I want to do when I grow up, I decided. The sense of power! You walk up into the partly-darkened control room. Sitting at the console to the right of your chair are a technical director and an audio director, with an associate director sitting to your left. Hanging from the ceiling are three large monitors, all showing a blank gray waiting for your command. In front of the console is a "trench" a couple of feet lower, with another console down there manned by a video engineer. On top of that console are seven more monitors, each showing the viewpoint of one of the cameras or other sources, each with a green-glowing oscilloscope screen showing the state of the camera with a multitude of knobs for adjusting. Each piece of equipment has a fan which runs constantly, producing a background hum of restrained power. You sit down at the console and put on a headset to communicate with your crew. Between the monitors hanging from the ceiling and the monitors and oscilloscopes below you, you can see through a soundproof glass window into the studio. Everything is set. "Ready to fade up on four, ready music," you say. "Up on four, start music." The overhead monitors come to life. "Ready to cue talent, ready one, ready to fade music. Cue talent, take one, fade music. Ready two; take two. Ready one; take one, camera two go to your second shot. Ready three; take three. Two minutes. Camera two, tilt up a little, please. Ready two; take two." Allen Funt's visit was interesting, but his movie is not one I would recommend for general viewing. The film is titled What Do You Say to a Naked Lady? and is basically a modification of the Candid Camera television show. You ask, "Do you have a lot of free time as a graduate student? 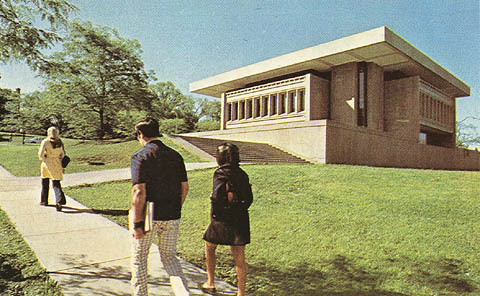 Is graduate study more difficult or easier than it was at Oberlin?" In October I would have answered "Yes" and "Easier," but now that a few papers and projects are beginning to pile up I'd answer "Sort of" and "About the same." It definitely isn't nearly as far above college as college was above high school in terms of difficulty, standards, or anything like that. The supposed difficulty of getting into grad school had led me to believe that graduate study was much more difficult than college-level study, but that hasn't turned out to be true, at least not here. In fact, one of our more demanding courses is simultaneously being taught to undergraduate juniors; they get it on Tuesday, we on Thursday. Syracuse is still on the archaic system in which the first semester does not end until mid-January and is followed by two weeks of Final Exams. So I still have another week of classes to go  the busiest week of the year, naturally, since almost every class has a paper coming due this week  and then there'll be finals week. For graduate courses, which meet once a week for two hours at a time, the finals schedule is simple: the class just meets during the first week of the finals period as if they were going to hear another lecture, but instead they take a two-hour test. Clever. During the second week of the finals period, since we TVR people have no more exams, we're going to take a bus down to The City (that's how its provincial inhabitants refer to New York oftentimes) for three days of talks by people in the broadcasting industry down there. Then, back to Syracuse for second-semester registration. The high point of the end of the semester came on Thursday, January 15, a typical Syracuse subzero day. In the morning in our Studio Operations class, following the final exam which was given during the first half of the period, I received one of the four PaFaTaM awards. PaFaTaM, pronounced "paff-uh-tamm," stands for People and Facilities and Time and Money, the four things which our instructor says a producer has at his disposal with which to produce a program. The PaFaTaM award is the Studio Ops version of the Academy Award; namely, a half-pint milk carton with some teletype paper stuffed into the spout. Not quite as nice to put on your mantel as an Oscar, but nevertheless, all in all, rather ugly. Someone suggested that after keeping it on the mantel for a while, I might find a better use for it two or three feet below the mantel. In the afternoon came my ten-minute television production. I had decided to do a news show, with five minutes of news illustrated with Time and Newsweek and New York Times pictures, followed by a commercial, followed by a three-minute interview, followed by the newscaster giving the weather. It was rather complicated, and amazingly, it came off almost perfectly. Everybody did what they were supposed to do and did it beautifully, everything came off on time, and I gave each of about a hundred instructions at exactly the right time and with authority. It really looked like a professionally-done show, I think. Of course, I don't have my grade back on it yet, but the lab supervisor wouldn't believe that I hadn't had some experience in TV directing before I came to Syracuse. I even surprised myself. See also TV Show & Tell, 1970. I'm going to Washington D.C. in a couple of weeks, March 29 to April 1 to be exact. The TV-Radio Department has organized another trip similar to the New York one; we'll all stay in the same hotel this time, and people will come in to speak to us. These trips, known as the Benchmark Series, are described in another thread from these letters. Click here to go to that thread. Every week two people from our TVR class produce and direct a half-hour television production at the local educational station, WCNY-TV, and the rest of us serve as their crew. The shows are taped on Wednesday morning, and the better ones are aired a couple of months later; the inferior ones are never seen outside of the class. This past Wednesday we had the most ambitious production ever done in Syracuse. It was a show about how the Moog synthesizer works, using electronic visual effects to complement the electronic aural effects of the Moog. Before even coming to the studio, the two fellows who were producing the show had assembled a half-hour video tape. On it, a professor explained the Moog as he sat on a stool in another studio, with drawings being flashed onto a screen behind him. He gave four of these explanatory talks, each a couple of minutes long, during the half-hour. The space in between was filled with silent films  commercials, animated Walt Disney films about rocket travel, atom bomb explosions, and so forth  with Moog music on the sound track, the music being especially written to illustrate the points that had just been made by the professor. All of this was already on tape. They used the sound track of that tape as the sound track for their show, but they added to the video between the professor's explanations by using just about every special effect that's possible in black-and-white television. Speeded-up motion, silhouetted dancers superimposed on each other, flashing lights out of focus, high-speed switching between one picture and another, cutout areas of one picture being replaced by another picture, the outline of the professor floating eerily off into the distance at the end of his explanations, negative polarity, an oscilloscope trace following the audio, and some others I can't even describe on paper. My job during all this was to sit in a back room beside one of the video tape recorders (a machine about twice the size of a computer tape drive, or to put it in more mundane terms, about twice the size of a refrigerator). This machine was being used to play back the already-recorded tape; in the control room they were adding more video to it from three cameras and a film projector, and the final product was being sent back to my room where it was recorded on the next video tape recorder down the line. As I sat beside the first VTR (video tape recorder), I was to keep an eye on its digital tape counter. This is like those three little numbers in the window on your Sony, except that on the VTR the numbers read minutes and seconds. It had already been determined at exactly what time on that tape certain things occurred, such as the professor starting one of his explanations; I was to warn the control room, via an intercom headset I was wearing, so that the director would know exactly when everything was coming up. I began to feel like I was manning a console in Mission Control. Sidebar: For a "transcript" of what it sounded like on my headset, click here. Surprise! I'm still in Syracuse. You see, we TVR students have a summer semester too. This is an eleven-month program (I think I told you that; evidently one of us has a short memory). We have the regular two semesters followed by a nine-week summer session, and on August 6 we graduate with Master of Science degrees. Then, hopefully, I'll be heading off somewhere for my first job in the broadcasting industry. Slight problem: there are very few jobs available. The economy's a little tight, and when somebody who is currently working for a station quits, the station might not replace him. I was there on the afternoon of June 3, watching them put together some of their programs. It's a crude operation, much less sophisticated than even our lab setup here at Syracuse, but they are doing a lot of programming, and if I worked there I'd have a fairly important position in producing it. The question is whether they're going to be well enough off financially, as of August, to hire me. They've got a low-budget operation that they're trying to make pay for itself with advertising, but as of now they have sold very few commercials. I'll also be writing to a lot of small stations to see if they have any jobs open. During the summer, I'll be taking courses that meet five times a week instead of only once, this more concentrated schedule being required because the summer "semester" is only a few weeks long. The S.U. commencement ceremony was telecast live and in black and white over Channel 3 from 10:00 to 11:33 a.m. on Saturday, June 6. The whole thing was produced by TVR grad students; Channel 3 simply broadcast it for us, without commercials. Although we had done some cable-laying and other preliminary work the day before, on Saturday we had to start at sunrise (5:30 a.m.) so that we could get our three cameras and other equipment set up, operating, and adjusted before people started arriving for the ceremonies. 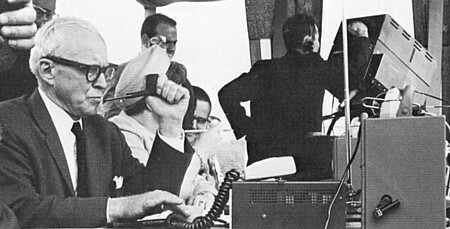 In the crows nest atop Archbold Stadium, connected by telephone with nine key assembly points, and surrounded by TV equipment and a supporting staff of specialists, sits Kenneth G. Bartlett, special assistant to the chancellor and chairman of the commencement committee  master-mind of the entire production. During the telecast I was the audio mixer behind the podium. I had charge of five mics on the podium, plus a line from the conservatory over which came fanfares and organ music (there's no organ in Archbold Stadium, which was where this great event took place). I mixed all these together and set them up to the control truck, which was a Hertz van which we'd outfitted with our portable electronic gear. There, under the watchful eye of the director, another audio man mixed my feed with a commentator's mic to get the total audio for the show. 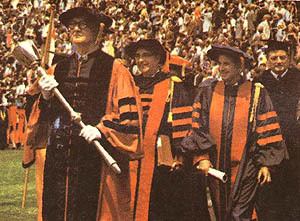 The leader of the academic procession carried a silver mace, placed it in a receptacle at the front of the podium, and declared that the proceeedings had begun. One of my five microphones was for the sole purpose of picking up this opening statement from the macebearer. The Carrier Dome was later built on the site of Archbold Stadium. Most of the crew couldn't see what was happening, except by television. This was certainly true for the people in the control truck, which was parked outside the stadium. It was also true for me; I was working just behind the curtain that formed the back wall for the speaker's platform, about fifteen feet behind and four feet below the lectern. U Thant and Julian Bond spoke that morning, but I was able to see them only on the little portable TV set that was provided for us. Since then, I've been spending most of my time worrying about FM-88. That's the campus radio station here (its real name is WAER), a 3500-watt operation reaching a potential audience of half a million people. During the regular two semesters WAER is operated by undergraduates, but since they're not around during the summer while we grad students are, during the summer we get to play with the station. I'm Chief Announcer, which means I train disk jockeys and assign them shifts. Since I'm taking only nine hours rather than twelve, and since it's mainly classroom work rather than studio projects, I should be able to spend a fair amount of time at WAER. Fun. Things have been very busy here at Syracuse, culminating in yesterday's televising of the 1970 Onondaga County Volunteer Firemen's Convention. WCNY-TV is on channel 24 here; it's an educational station, and the only UHF station in town. One of its problems is that people don't realize its existence. They think the only stations are the three commercial ones, channels 3, 5, and 9. So in order to publicize itself a little better, WCNY decided to televise the above-mentioned event this year, using us graduate students and its own remote equipment. We taped it yesterday, and it will be aired next Saturday and Sunday; supposedly, every volunteer fireman in the county will want to watch, and when he sees himself on TV, he will thereafter remember WCNY-TV forever. This photo, taken the previous year, later appeared on Mike Clarks website. 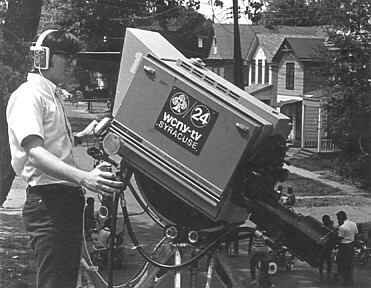 It shows Mike at the age of 17 operating one of WCNY-TVs black-and-white remote cameras. A zoom lens is in use here, but the turret also typically contained a 2 fixed wide-angle lens and one or two others. For more about the station and its studio cameras, click here. I got up at 4:10 a.m. yesterday morning. 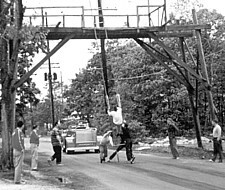 The crew arrived in Jordan, New York (population a few thousand) sometime after 6:00, and we started setting up the equipment in the rain. Once again my job was my specialty, audio. With several helpers I ran cables from the big green truck out to the area where things would be happening and attached a microphone to each one; then, as the rain stopped, I joined the director, technical director, assistant director, executive producer, and three technicians inside the truck, which had about as much interior space (and electronic gear!) as a combined command module and lunar module. We put together a half-hour program on the parade that passed us between 10:00 and noon. At noon, the crew dashed out madly to rearrange the cameras and microphones to cover the Firematic Races, which started promptly at 1:00. We had no time to eat or rest, and on top of that it rained some more during that hour. Then from 1:00 to 6:00 it was back in the green truck for the taping of another program, which will run either an hour or an hour and a half depending on how much they decide to edit out. 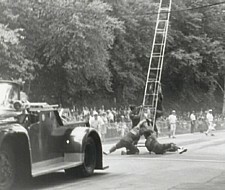 Here are some photos from other firemen's competitions of that era. For more about such events in New York State, click here. Following that, we taped three versions of the commentator introducing the show (one said "for the next 60 minutes," another said "for the next 90 minutes") and one version of his closing. Then we spent an hour or so putting all the equipment back into the green truck. The biggest job here was coiling up all the audio and video cables, which were wet and dirty from all the activity and had to be wiped with rags as they were coiled. Finally, after 12 hours of work without a break (I did manage to eat a cold hot dog with one hand while working the audio controls with the other during the afternoon session), we came back to Syracuse. Television is glamorous? Well, at least it's fun. So now you can tell everybody that someone you know helped televise a volunteer firemen's convention. Update: In 2010, I found in my files some formats and other planning documents for this event. A wooden arch was erected across a street where the parade would take place in the morning and the races in the afternoon. Our green WCNY-TV remote truck parked opposite the arch, borrowing electricity from the nearby school-bus garage. Ive redrawn the layout below, and I returned in 2014 to photograph the area. We deployed three cameras at the positions shown in blue in the morning and the positions shown in red in the afternoon. To gain a little height, Camera 3 was mounted atop a small Gertenschlager remote truck. However, to see the parade units approaching from the left we still had to shoot through the leaves of a tree. As the audio director, I planned to deploy five microphones to the positions indicated by the letters A through E above. Each mic was connected to the mixing console by its own cable with an XLR connector on each end. (Nowadays we would use multicore cables, but those DT-12 "snakes" weren't available yet.) The mics along the course from left to right appeared as the first three sources on my console. Cable A ran to a spot alongside Camera 1 at the far end of the course (to our left in the morning, but to our right in the afternoon). For the announcers introduction on camera, we connected a hand mic to this cable; for the parade, a mildly directional cardioid; and for the races, a highly directional parabolic. Cable B at first ran to a shotgun mic at the arch, facing the oncoming units during the parade. Then in the afternoon, B was near the hydrant where the firemen would be frantically connecting their hoses, an estimated 350 feet from the green truck. Cable C ran to the Gertenschlager, where a highly directional shotgun mic was mounted on Camera 3 to pick up the sounds of whatever the camera was looking at. Cable D also ran to the Gertenschlager, which did double duty as the press box for our announcer Mike Watt and his analyst. They shared a hand mic, which appeared on my console as #7. Cable E was the shortest. It was used for a crowd mic on the outside of the green truck, feeding background sounds from the 12,000 spectators to the #8 input on my console. 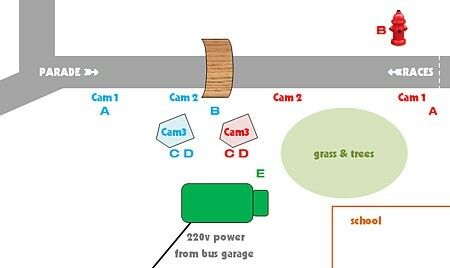 This plan required at least a thousand feet of cable. If we hadnt found enough, I was ready with three backup plans, including running cables A,B,C,D to the Gertenschlager to be sub-mixed there before being sent on a single cable to the green truck. In our production meeting beforehand at the University, in Room 108 at 1:00 on Wednesday afternoon, the crew heard a description of the signature event of the races. A fireman, carrying a ladder and the business end of a hose, runs up to the arch. He leans the ladder against the arch, climbs up, pokes his brass nozzle through an opening, and squirts a horizontal stream of water at a metal target 50 feet away. When the stream hits the target, it tips up with a satisfying plink, and the clock stops. We giggled at this description. How graphic, remarked Edie McClurg, who would be the associate director for the races. However, I made sure I was able to capture the sound of the plink. I may have added a sixth mic for this purpose, or maybe I simply faded up mic C.
According to the schedule, I first visited the site on Thursday afternoon with the producers, directors, and WCNY engineers. On Friday, the engineers parked and powered the truck in the morning, and some of the crew spent the afternoon setting up equipment. On Saturday we would be there all day, along with 16 additional students divided into Crew 1 for the morning session and Crew 2 for the afternoon. At 6:00 on Saturday morning, July 18, I was at the parking lot below the Universitys Newhouse Center to get a ride with Charles Reina. By 7:00, we and the rest of Crew 1 were at Jordan, running cables under the supervision of field manager Alex Sahlman. Director John MacKerron gave his final instructions at a 9:30 meeting. We began taping the parade at 10:00. This Carnival included fire trucks and auxiliaries from 43 towns and villages in Onondaga County, along with 15 marching bands. Our 90 minutes of coverage would be edited down to a 30-minute program, during which we hoped to feature at least one unit from each of the towns and villages. By the time the parade finished at noon, Crew 2 had arrived. We quickly repositioned the Gertenschlager and the cameras and the mics for the Firematic Races. 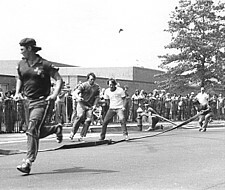 There would be eight events over five hours: equipment race, one- and three- and five-man ladder races, motor hose race, wye race, efficiency replacement, and 12-man bucket brigade. Mike, it all started back before the turn of the century in 1899  and every year since. In fact, the second Convention was held here [in Jordan] in 1900. This is the 72nd Convention to be held here in Onondaga County, and this is the third time the Convention has been held in Jordan. We should see plenty of action and plenty of water  I imagine everywhere. The winning time last year was 17.4 seconds by the East Syracuse Fire Department. We wish to thank Chief Bob Milton of the Jordan Fire Department and Doug Milton, Chairman of the Firematic Races, for their invaluable help. This is Mike Watt. Executive Producer has been Richard Barnhill. Producer, Richard Lewis. Director, John MacKerron. Associate Producer of Firematic Races was James K. Straub. Audio Director, Tom Thomas. This has been a Syracuse University Sequence 22 production in association with WCNY-TV Syracuse. Mike the announcer let us know when it would be advisable to start taping again. ("Hello, big green truck!") When John the director wanted to begin the next take, he gave the roll cue. The tape operator began a ten-second roll to the edit point while Richard counted down. Once the machine was recording (at 45:10), John said take and Richard cued Mike to begin talking. As I had little else to do during this edit procedure, I helped by calling out the tape status when appropriate. I was also instructed to "fade at the end of each take (if applause continues)." We undoubtedly ended up with more tape than we planned to air. An editing session was scheduled for 9:00 to 5:00 on Monday at WCNY, plus a little more time on Tuesday if necessary. I wasnt involved in this process, in which graphics and supplementary audio were added (titles, credits, theme music, and even some film footage). The tentative air dates were the following weekend. 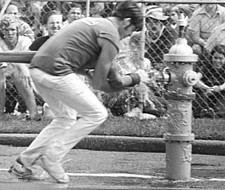 The Carnival was only of local interest, but there was some hope that the Firematic Races would be aired again as a Sports Special on the Eastern Educational Network. By the way, there's a remembrance of our executive producer Mr. Barnhill on page 16 of this magazine (page 18 of the PDF file). We graduate from Syracuse August 6. That's next Thursday night! The graduation ceremony is a big fancy dinner with a lot of speeches and things; it'll be hard to endure, but I only have to go through it once. The day before, we have our "comprehensive exams," a few hours of general essay questions to see whether we're qualified to receive the master's degree. Other events of this final week include a three-hour showing Monday afternoon of the products of the summer Studio Management course, which will consist of five programs on video tape (many of which have already been broadcast), and a two-hour showing on Wednesday night of the "Best of 22," a collection of excerpts from the best video-tape and film productions of Sequence 22, which is us. Although I wasn't a member of the class, I helped out on the crew of three of those five Studio Management programs. In one, I also played the role (in a two-minute comedy sketch) of Dr. Loren Phippsley of the research and development laboratory of Jiu Jitsu men's toiletries. I was supposedly developing a new version of our Jiu Jitsu after-shave (a takeoff on Hai Karate) that would repel Women's Liberation types while still attracting normal females. I didn't think the bit was especially funny, but everyone else thought my acting made it so, so I feel flattered. Or something like that. For more details about this performance, click here. A recent listing of where my Syracuse classmates are now reveals that 26 are in broadcasting (half in Syracuse, the other half elsewhere), 6 in teaching broadcasting, 2 in film-making, and 2 in advertising; 17 are in other fields, ranging from homemakers to ski instructors; 2 are still studying, and 5 have not yet found jobs. I did exchange letters with Laughing Larry [department chairman Dr. Lawrence Myers] last September. What started it was a notice I got in the mail that I had an "incomplete" in the summer Research course, TVR 697. Upon getting that notice, I recalled that my term paper in that course had been returned to me along with other papers when we took the comps, but that there had been no grade on it. I wrote Dr. Myers, asking whether perhaps he'd mistakenly returned the paper to me before even reading it. He replied that apparently he had, so I returned the paper once again to Syracuse and in due course received my grade and, a few weeks later, my diploma. In my letter to Dr. Myers I had described my work here in Ohio, in terms of studio operations and cost-per-thousand and all sorts of other things we'd been exposed to at Syracuse. He wrote back, "Your work at the Marion CATV operation is a fascinating description. I trust you won't mind if I read excerpts to our new sequence, as it touches base with so many of the activities in which they are, or will be, engaged." So he's still reading his mail in class!